The Russian Revolution of October 1917 was unique. It was the only time in history when workers themselves took over the running of the state in a conscious attempt to build socialism. The fact that it eventually failed does not diminish its power to inspire. Whatever your views, any understanding of revolutionary experience has to take the October Revolution as its starting point. Of course the October Revolution was not perfection itself. Revolutions tend not to stick to the clean paths of historical schemes dreamed up in the abstract. But the events of October 1917 were more heroic and promising than the lies of academic hack historians would have us believe. Above all it must not be forgotten that the Russian Revolution was part of an international revolutionary wave which brought the First World War to an end. Revolutions broke out in the next few years in Germany, Hungary and Austria whilst around the world (and not just in Europe) the years 1918-23 saw a series of massive class movements. Only one party anticipated and promoted such an international movement. That was the Russian Bolshevik Party. All the other Social Democratic Parties which belonged to the Second International (with the exceptions of the small Serbian and Bulgarian Parties) rushed either to support their own imperialist government or lapsed into pacifism. Despite the anti-war positions of individuals in other countries only the Russian Bolsheviks as a whole took the stand of opposing imperialist war by class war. If they had done nothing else the Bolsheviks would have been notable in working class history just for standing against the tide of chauvinism in 1914. But they achieved much more. In the October Revolution they were the organisation to which the most class-conscious Russian workers belonged. It was they who actually replaced the bourgeois Provisional Government with Soviet power. And Soviet power at the time was a far more vibrant democracy than anything the bourgeoisie has ever produced. Soviet delegates were instantly recallable and therefore much more responsible to those who mandated them than any bourgeois representatives who get elected for five years and can please themselves after that how they act. Of course not everything was perfect with this budding proletarian system. To begin with, the Council of Peoples’ Commissars was not directly responsible to the Soviets and tended to function like a bourgeois cabinet. After the attacks by imperialism, which began in March 1918, including the support for the so-called White Guards, the next three years saw the decline of the Soviets and the development of Party rule. But this was not a premeditated act by the supposedly power-hungry Bolsheviks. It was the logic of three years of civil war in which at least 8 millions perished including the cream of the Russian revolutionary proletariat of 1917. Creative activity at the grass roots is the basic factor of the new public life. Let the workers set up workers’ control at their factories. Let them supply the villages with manufactures in exchange for grain... Socialism cannot be decreed from above. Its spirit rejects the mechanical bureaucratic approach; living creative socialism is the product of the masses themselves. In this short history we cannot do full justice to the vitality of the Russian proletariat of 1917. What we have tried to show is that in its historically-discovered form of government, the soviets, it gave a lasting gain for the working class everywhere and how, despite its inevitable subjective errors (much magnified by our class enemy), the Bolshevik Party became a genuinely revolutionary instrument of the Russian proletariat. 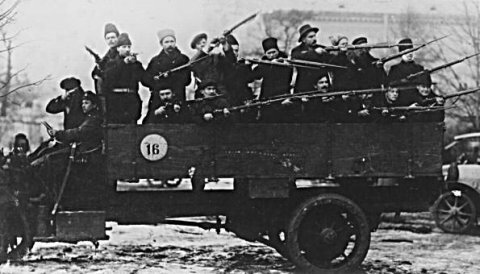 On the way we debunk the myth that the October Revolution was a carefully planned coup by a bunch of professional conspirators and demonstrate the profoundly mass character of October 1917. Good to see this on the net. I will advertise it as I can.